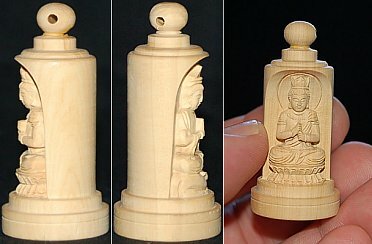 Wonderful and intricate carving of Dainichi Buddha (Tathagata) with screw-on protective cap. The top of the statue has a small hole, allowing you to insert a string or other cord to connect the piece to your cell phone, car mirror, or anything you like. 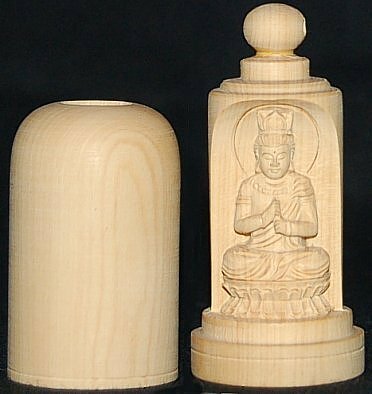 Two pieces: (1) protective cap and (2) main piece with the deity's effigy; both pieces screw together snuggly for compact storage. Size of Mini-Tower when screwed shut. The deity shown here is not Dainichi. But Dainichi piece is the exact same design and size.